If good things really do come in small packages, then the Volkswagen Polo R WRC should be very good indeed. This limited edition performance version of Volkswagen’s micro hatchback could the perfect rational alternative to a Mini John Cooper Works. Like the Mini, this Polo is inspired by the World Rally Championship, the same dirt fest that brought you the Subaru Impreza WRX and Mitsubishi Lancer Evolution. The Polo R WRC lacks the Japanese cars’ sophisticated all-wheel drive systems, but it has more than enough power for a car of its size. 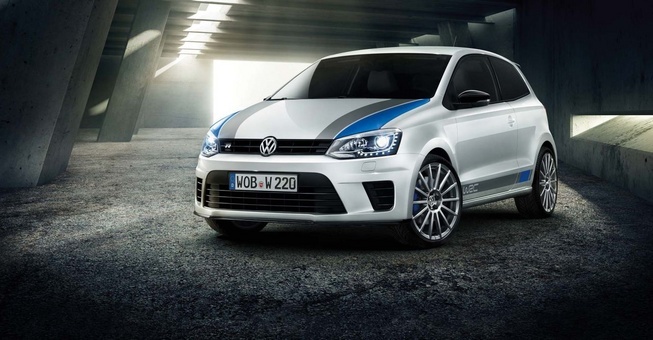 The front-wheel drive Polo is motivated by the 2.0-liter four-cylinder engine from the larger Golf GTI (the VW hot hatch most Americans are familiar with), tuned to produce 220 horsepower and 258 pound-feet of torque. That’s 20 hp more than a stock GTI, and nine more ponies than the top Mini John Cooper Works GP. However, the VW is a tick slower than the Mini. 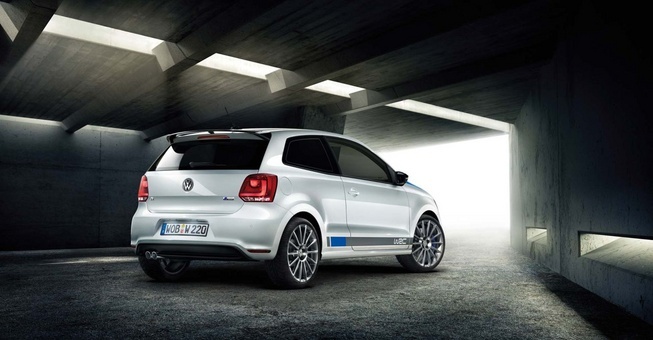 Volkswagen says the polo R WRC will reach 62 mph (100 kph) in 6.4 seconds; the Mini GP reaches 60 mph in 6.1 seconds. Top speed is a dead heat, with both cars reaching 150 mph. The Polo R WRC also matches the Mini John Cooper Works GP in the important category of looking fast. A more aggressive front bumper, rear spoiler, chrome exhaust tips, and rally-style 18-inch wheels make the Polo look like a fun sized Golf R.
The spectacle doesn’t stop there. The Polo R WRC is only available in white, because it allows VW to show off its blue and charcoal decals and blue brake calipers. They definitely make this little hatchback look like a rally car. All it needs is a number on the door and some sponsors. The interior is equally racy. Leather and Alcantara bucket seats should keep the driver and front passenger where they belong, while a three-spoke steering wheel and aluminum pedals complete the look. The Polo R WRC also comes with navigation and an armrest, which is apparently an option on this economy car. The Polo R WRC proves that even staid Volkswagen can occasionally break loose and have some fun. Unfortunately, very few people will be able to partake. The Polo isn’t even sold in America, and European buyers will have to fight over just 2,500 copies. Volkswagen did not list a price but, since this is a limited edition with significantly upgraded hardware, it probably won’t be cheaper. Hopefully it will sell for less than the Mini John Cooper Works GP, which costs $39,950.